Climate change and human activities have accelerated desertification, reducing agricultural productivity and threatening human health. 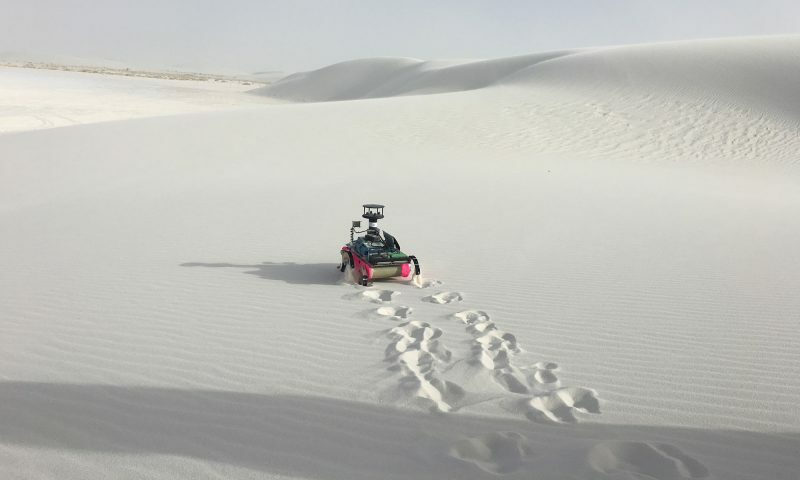 In order to effectively control and prevent such situations, a better understanding of the desert environment and sand transport dynamics is required. Mobile, ground-based robotic platforms like RHex can provide datasets with greater spatio-temporal resolution than existing methods, which mostly consist of fixed instrumentation. 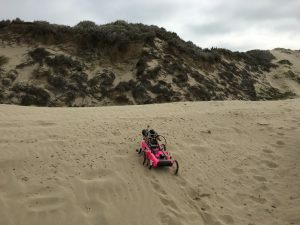 An intelligent, mobile robot can also treat informative scientific data as a resource, applying concepts from game theory to explore an environment for high-resource areas and “exploiting” the data it collects in real time to differentiate between competing models of sand transport dynamics. 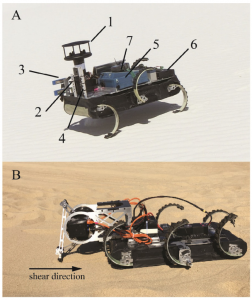 The desert environment offers a challenge for locomotion as well, as the loose sand can yield and flow upon the contact of robot legs, resulting in poor mobility. We have taken RHex on desert research missions with aeolian scientists in White Sands National Monument (New Mexico), the Jornada Experimental Range (New Mexico), Little Dumont Dunes (California), Oceano Dunes (California), and the Tengger desert (Ningxia province, China), where RHex collected valuable data set to help aeolian scientists solve challenging problems. Our on-going work includes deploying a heterogeneous group of collaborative legged robots to provide different levels of feedback to geoscientists during field data collection: Minitaur, a quadrupedal “scouting” robot, performs fast, dynamic locomotion while using its direct-drive legs as force sensors to assess soil strength, providing a preliminary map of soil erodibility across large areas; RHex, a hexapedal “measurement” robot, performs stable locomotion while carrying multiple scientific sensors and instruments, providing comprehensive assessment of controlling variables such as soil moisture and grain size that correlate with erodibility measurements. We expect that these different types of feedback can help improve the efficiency of human decision making in field missions. This work was supported by the US National Science Foundation under an INSPIRE award, CISE NRI # 1514882, and NRI INT award #1734355.